From September onwards we shall run the Workshop for the Jazz Smugglers band and their friends, every two weeks. Sundays at 7.00 Creek end, Smugglers Lane, Bosham po188qp. It will be quite demanding and will bring in specialist tutors from time to time. THIS IS ONE OF THE MOST BEAUTIFUL JAZZ TRACKS EVER BY A SMALL GROUP. In my view anyway, ok? This group played together for 16 years. This tune is played by Desmond on alto with Brubeck on piano echoing. Brubeck's chords on his solo are downbeat as befits the tune with tension built into the bridge. This song was the anthem of the Depression. Notice how often he replays a phrase and displaces it. Desmonds solo follows the shape of the tune, Brubeck is playing fills in the background not comping. Desmond goes into characteristic repeats of his phrases and uses parts of the tune. Both play the final section, echoing each other, Desmond responding to Brubeck then switching around. Counter point, all the time. Both of them are still downbeat. Finally they play out the last 16 of the tune. The tension in the group owes much to the airy, light, melodic alto sax and the heavier chord play of Brubeck with tension built into his voicings. It was very painful for him to play fast notes in his right hand after a bad accident damaged his nervous system. How worthwhile that a group plays hundreds of time together. Boys would you care to copy this in our workshop one night? Get it spot on and then transfer the technique to some new somgs? Scroll down to the bottom for an activity list. Audience sizes. Smallest paid audience was 8, largest was 91. 580 attended 10 gigs. The PRODUCT is the single most important factor. All the audiences were members of the general public with a very strong emphasis upon the over 55's. There were very few specialist jazz followers. They came to listen and watch, unlike most jazz events which are used for background music. The three sell-outs were Quinto, Les Voyageurs, and Maria with Jazz Smugglers. The first two looked like a different kind of jazz act, the other one was backed by a good title and Jazz Smugglers' local reputation. The failures were the first two gigs; "Watch the Jazz Greats on video". Only 8 bookings for this, dreadful title. The Country gig was also weak with 29 and these two gigs probably suffered also from the fact that this was the first weekend of the Festival and it was not widely known about. Audiences built up as the month progressed. Many people repeated and came to 2 or more events. Take care with scheduling gigs at the beginning and at the end of the period. Jazz Smugglers as a name was probably over-exposed. It might be noted that 2 Smugglers big concerts needed special measures by way of promotion The third was a sell out. Better to save the Smugglers name for one or two gigs, and just supply unnamed jazz backing for other events such as talks. The Jazz Smugglers name should generally be under the title. The title is more important. The advertising road signs leading to Hillier went up late but were very effective. When jazz is associated with something else, such as a lecture on country life or gardening, the whole thing sells well if the personality is known. In another Festival event they combined poetry and jazz and it was a success. Neither would have sold on its own. Promote the notion that people can bring drinks and a picnic with them in each gig. Think about a true prestige event, high cost, dinner provided and sell tables of 4 for charity. 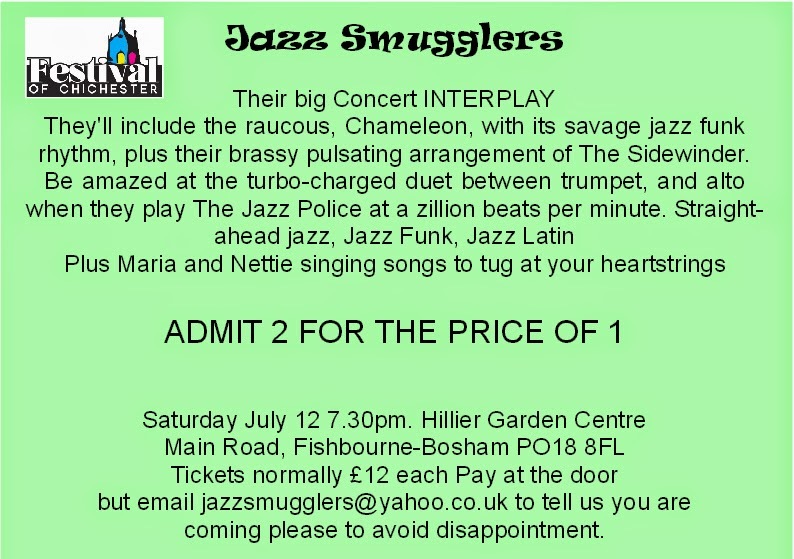 A small poll was carried out amongst some people who had brought small groups with them asking how they knew of the Hillier Jazz Month initially, how they knew of this particular gig, and whether they had attended another jazz month event beforehand. The Festival Brochure or Website was the principle means of knowing of the Jazz month mentioned by over half. Equal second were the Road Signs and the Chichester Observer articles. Not mentioned by anyone was Facebook, other Event websites, emails, or Village notice Boards. This does not mean they were useless just that they did not feature prominently. Our Facebook audience is strongly biased towards other jazz musicians, not the general public nor jazz enthusiasts. Jazz Smugglers band page has only 79 Likes and we need 1,000 to make it work. We did boost the important first Facebook post and received no results. We have done this 5 times in the past with no results even when a free ticket was offered. We added about 23 new email addresses to our audience lists, from the special offers. We reserved special offers for the gigs which were going to be difficult to sell, when judged by the early booking results. Generally successful results amongst people who know us. This gig had a dreaful title and only 8 tickets were sold. But with the emailed complimentary free tickets about 24 people came plus 31 friends of the band, making 63 in all. Overwhelmingly, the best results are obtained from people who know of us already, and this has always been true. Keep existing customers sold is the main aim. In the end the event was well sold out (73) at the last minute from the general audience. Sales were shared equally between the Ticket office and Hillier. To people attending the other concerts (500+) we handed out about 200 tickets offering 2 4 1 for our final Jazz Smugglers concert. This was always going to be difficult to sell because most had already seen the band. This was very successful with 7 bookings, 14 people. We also emailed this offer to local residents and the band and we had 6 bookings, 12 people resulting. So 26 people (maybe a few more) out of the final audience of 60 used this promotion. Only 9 tickets for this were sold by the ticket office, so concentrating upon our existing loyal audiences worked. Mailings with free tickets or 2 4 1 to our cold mailings lists did not attract responses. Altogether out of 581 people attending events, 93 came through special offers, nearly all for the first Smugglers gig and the last. Special offers are expensive. 55 people did not pay anything, and the 38 accepting 2 4 1 offers received a total discount of £228. We have no way of guessing how many would have come anyway. Conclusion. All media need to be used, People need to see it repeatedly and in different places. This is why Road signs work. People constantly are reminded, and the passing audience is huge - probably 100,000 cars pass in a month on the A259 each way. We could think about offering a season ticket to all the gigs. Promotions work when you need to get out of trouble, but mainly to the people who know you already. WHEN THE TICKETS WERE SOLD AND WHERE. A few tickets, 30, were sold in the first weekend of the Festival opening. They did give a fair indication of the final popularity differences between the bands. Mostly the numbers came in within the final three days before the event. But we had enough indication before then to know which event was going to need special promotion. In the beginning the ticket office sold most tickets but by the end Hillier was outselling them easily. When supplying the actual results, and the final accounting the Ticket office was excellent. They did put up a large A1 poster showing all the Jazz months events, but despite efforts to show individual A4 posters there was no response. There was also a mixed result when asking them for updated audience figures which we needed so as to know which concerts to boost. Generally ok, but a bit sloppy at the edges. I could probably get up a new poster each week if I took it in to them, but it gets tiresome this way. I'd like to know the breakdown between online bookings and face to face bookings. Quinto had fewer in the audience, 73, but their revenue total was £1000. Furthermore, Voyageurs quartet earned £144 each while the Quinto trio earned £270 each. Price does not make a huge difference to sales but it does make a big difference to the rewards. I speculate that it is a very bad error to assume that because you are the cheapest you will sell more as bands are inclined to do. This is a rich area. I also speculate that Les Voyageurs could have priced themselves at £15 and found an audience of 75, as big as Quinto. It is the Product which counts, and its relative apparent merits against the others. Discounts. My personal view is that it is pointless offering discounts for senior citizens. It does not pull any more sales, it just reduces revenue by a lot. In this area they are rich. They are not shy of asking for a discount at the door, and you can give it to them then, say £2. We abandoned the usual yellow background to save printing ink in favour of Red White and Black. They need positioning where the cars slow down at roundabouts and T junctions on the roadside leading towards the venue. Posters. A3 posters were printed by Hillier in-store. Another time a simple template design would be useful, with the text able to be copied direct from the first paragraph of the press release. This started months ago with a luncheon with Phil Hewitt the Editor of the Chi Observer , Andrew and myself where we discuss the following year. Before the Festival I asked Phil about story length, pic resolution size etc. Then we produced 10 press stories, one per event, each to 200 words long with a high res picture. All sent off together. Another time, make the 1st paragraph copy more exciting, (savage percussion, heartrending vocals, lightning riffs, etc etc) to be used also in the posters. We did ask for big coverage of our final event and the Editor did us proud with a full page and two pics. Nothing but praise for the bands, all played to a high standard, all easy to work with. No quibbles about money, they agreed on 2 4 1 offers, they all filled in contracts on time.They gave me some copy but it needed expanding from their websites. Pics came mostly from websites. Performances were first class, and universally enjoyed. I heard no complaint from anyone and a huge amount of genuine praise and warmth. WHATG HAD TO BE DONE. Activity list. 21/5 Blog site published to Facebook and website, reques to workshop people to share it and link to it. 20/5 Links to new blog site from smugglers blog, and from enthusiasts website. 25/5 prepare Jazz video press release for blog/ band to share it Fbook. 26/5 planning website listings, contact Barry. 31/5 prepare mailing for free tickets sent to band. 1/6 meet nigel tie up details. 2/6 ticket offers to Chi Obs staff. 7/6 new page Facebook, and boosted £5. One day. 9/6 band joining instructions Sunday. 10/6 light day. song lists etc. 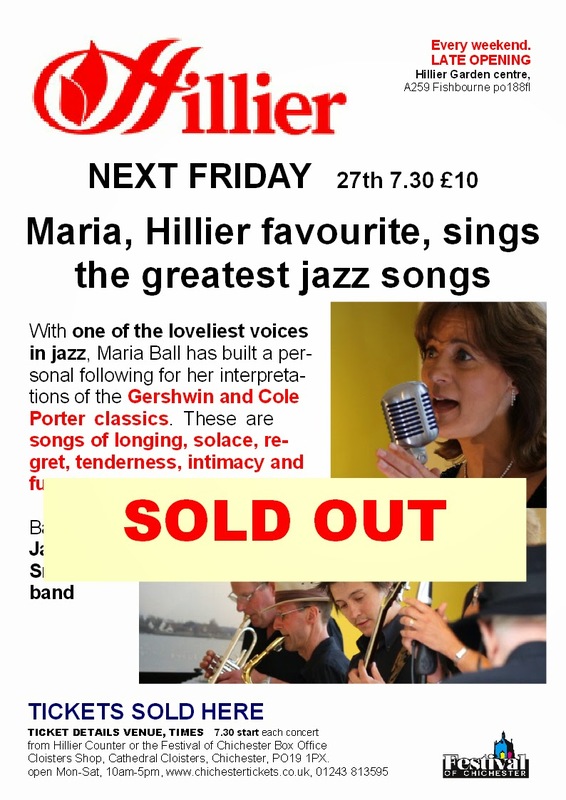 21/6 new poster for maria hillier. promote quinto mailing. terry to promote. 25/6 advised bands on set up and payments.